The HTC One A9S is a curious phone. 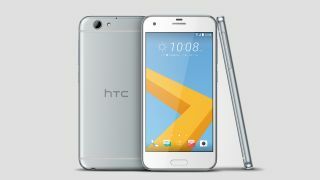 Last year's One A9 was strikingly similar to Apple's iPhone 6, and it seems HTC has taken the idea of 'adding an S to the name and just tweaking the spec' straight out of the Apple playbook. In fact, it seems to have doubled down on that strategy by not only offering very few spec upgrades in the One A9S, which was announced at IFA 2016, but actually dialling down the performance in some areas. Gone is the 1080p AMOLED screen, the Snapdragon chipset and the 13MP f/2.0 camera – in its place is a 720p LCD display with a Mediatek octacore chipset, and the same 13MP camera resolution but now at f/2.2, so lower-light photos will be slightly harder to pull off successfully. The battery has been pushed upwards to 2300mAh – still low, but combined with HTC's Boost+ it may be able to over-perform for its size. That's especially true if the phone comes with Android Nougat, which promises to be even kinder to batteries than Marshmallow and its decent Doze mode; however it's likely that HTC will launch the One A9S with the previous version of Android, and upgrade it later in the year. However, it's unfair to only focus on the specs, because the HTC One A9 was a well-made, all-metal phone for a little less cash than other flagship models, and the A9S continues that tradition. It'll be a well-crafted handset for less money – although some regions will get a 16GB+2GB RAM version, whereas others will be offered the 32GB+3GB RAM option. There are no front-facing speakers here to shout about, although the 5-inch screen fits well in the hand – the wrapped metal chassis feels pleasing under the fingers in the One A9, and it should be the same here. Storage can be expanded through microSD – and all the way up to 2TB, which not a lot of phones can offer right now. The real sticking point here is the HTC One A9S price... or rather the lack of one, with the brand simply telling us "[The One A9S] will be very competitively priced at the mid-tier". Without that important detail right now, it's hard to say whether this is a phone worth checking out. If it lands for around £175 / $250, then HTC could have a real power-player in the mid-tier market – a market that's fast becoming crowded, with the likes of the OnePlus 3 and ZTE Axon 7 kicking around. We'll update this story with any more information on the phone as soon as we get it – fingers crossed it's news of a half-decent price. IFA 2016 is Europe's biggest tech show. The TechRadar team is in Berlin to bring you all the breaking news and hands-on first impressions of new phones, watches and other tech as they're announced.